Chockstone - Rock Climbing in Victoria, Australia. 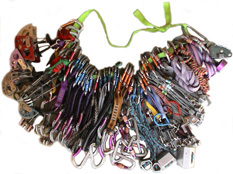 For All Your Climbing Gear. Rock Climbing In Victoria, Australia. Welcome to Chockstone fellow climbers. Within this site you'll find our on-line guide provides supplemental information about most Victorian climbing destinations including the major areas of Arapiles, the Grampians and Mt Buffalo. The gallery is chock full of images & video from all over the state and our interviews with local climbers has been a welcome addition to the articles section. A few pearls of climbing wisdom can be found in the tech tips, along with detailed photos of useful knots. 17-4 First time in the Alps, where to go? 1-4 Making Tassie Wilderness a Sport Climbing Venue. See Also: Find Climbers, VCC or WVCC for upcoming trips. Where to climb around Victoria, Australia. Details on featured climbs, photos, access notes, routes listed with heights & grades. Photos and video clips from local climbing areas. Photo Sales now available. Techniques to get you out of trouble and how to tie many useful knots, all explained with photos. Interviews with local climbers. Trip reports from the Chockstone team. Climbing book and movie reviews. New products highlighted. Links to other Australian and international climbing web sites. A place for Victorian climbers to hang out and chat about climbing. Search all Chockstone pages for keywords. Just what is Chockstone anyway?